Micro-aerial vehicles (MAVs) are small flyers that have become a point of interest due to their potential use as maneuverable stealth devices. A recent project of some researchers at two universities may have developed an amazing new spy device based on the biomimicry of bats. One of the main researches by the name of Gheorghe Bunget, stated, “due to the availability of small sensors, MAVs can be used for detection missions of biological, chemical and nuclear agents.” The difficulty is creating a device that is small and maneuverable at the same time. In order to form this creation, the researches first analyzed the bats’ skeletal and muscular systems and from this developed their very own skeleton of a “robo-bat.” This skeleton is small enough to fit in the palm of a human hand and weighs less than 6 grams! To cover the skeleton the researchers created an assembly of joints, a muscular system, and a wing membrane for the robo-bat to allow it to fly with the same flapping motion of a real bat. The robo-bat has sensory input that allows it to respond quickly to the conditions around it. For example, if a gust of wind picks up, the bat can adjust to this “as perfectly as a real bat.” This could not only be a surveillance tool with several practical uses, but it also helps with scientists understanding of aerodynamics. In creating the bat, scientists used low-power miniaturized radar and a highly sensitive navigation system that could help the bat find its way at night. 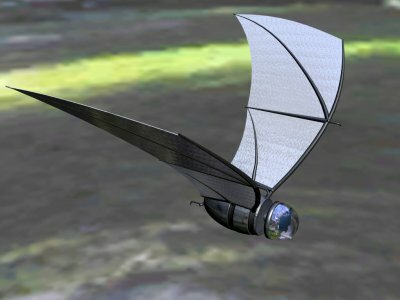 Energy for the bat’s lithium battery would be provided by solar and wind power, as well as other sources. This device would be very useful in that it could potentially use radio to send signals back to troops. “Bats have a highly-attuned echolocation sense providing high-resolution navigation and sensing ability even in the dark, just as our sensor must be able to do,” stated Kamal Sarabandi, from the U-M Department of Electrical Engineering and Computer Science. Echolocation, the use of sound emission and echo detection, is what allows real bats to navigate. Researches predict that the bat robot’s body would be about six inches long. It would also weigh about a quarter of a pound and use about 1 W of power. This incredible piece of technology would prove very useful for future situations. Yay, I love the RoboBat! You have pictured two different devices, though, so I’m a bit confused. The top one looks so much like the skeleton of a real bat! So is this robo bat controlled by someone remotely? Do bats fly very similarly to birds? The post material is very interesting, but unfortunately follows too closely the single source. It would’ve been nice to see that some other sources were consulted. I did research beyond this single source, but strangely there was very little information available for this topic and this seemed to be the only source with anything about this device. I apologize for the similarities between the source and the post but I assure you that I reworded as much as I could without excluding the important information of the article.